Thinkgeek's Retro Mini handheld lets you take your NES games on the go, which sounds like a dream from 1985 come true. Some dreams, however, are better left unrealized. "Way back in 1985 what would you have been willing to give for a handheld NES?" online retailer ThinkGeek asks in the production description for its Retro Mini, a handheld device that plays NES games. Well, if I had been alive in 1985 (missed me by a year, ThinkGeek), I probably would have said "everything that I own," which would have included nothing. In any case, a portable NES sounds like a great idea, right? Especially nowadays when everything 8-bit is totally hip. Well, it turns out that what sounds awesome in your head is not so rad in real life. Problem is that NES cartridges are freaking ginormous (who could forget?). While the Retro Mini itself looks to be the size of any average handheld gaming system, when you stick a huge NES cart into it, it sticks out like a, uh, huge NES cart. 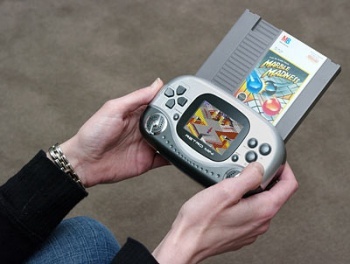 If you're still interested, the Retro Mini's retailing for $49.99, though factor in the cost of the 4 AA batteries you'll need to keep its LCD screen pumping out those beautiful 8-bit visuals. It also comes with AV out cables so you can hook it up to a TV if you want, which could make it a worthwhile NES substitute if you're sick of keeping the system around. This could almost be cool if you worked it the right way, in the same way that ugly graphic t-shirts and trucker hats are so uncool that they're cool. You could rock this thing on the subway and be all "yeah I know this thing is hideous, but I'm so cool, it doesn't even matter." But then you would be an obnoxious idiot, so maybe don't try that.